Yesterday’s Diamond Jubilee river pageant was an extravagant spectacle to commemorate Queen Elizabeth II’s 60 years on the British throne. In March 1995, on this day (Human Rights Day) in South Africa, the Queen commemorated something similarly historic, with slightly less pomp and ceremony, in a dusty township in South Africa. The occasion was no less grand. In May 1994, Nelson Rolihlahla Mandela was sworn in as President of the newly-democratic South Africa. I remember voting in those historic elections and feeling an overwhelming sense of being part of something special. In March 1995, the Queen and Prince Philip paid their first official visit to the newly-free country. At that time, I worked for a non-government organisation that received funding from the British government. Ours was selected as one of two beneficiary organisations in Cape Town that would receive a royal visit. Planning began in earnest about four months ahead of the visit. The Queen’s time was limited, so we two beneficiaries set up a ‘visit site’ at the other organisation’s premises in Khayelitsha. Their premises proved bigger and more adaptable for the visit than our premises, which were mostly in church halls and community centres. Khayelitsha is an area of the Cape Flats in Cape Town, South Africa. The Xhosa name means ‘new home’ and it is reputed to be the biggest and fastest growing township in the country. Our organisation worked in that and other communities, to train unemployed people to start their own small businesses. equally, the people who will meet the Queen get the information required for meeting her. The day dawned: Tuesday 21 March 1995. Human Rights Day in South Africa. We all travelled together to the Khayelitsha venue to get ready for the visit. Everyone was dressed to the nines, ready with their own story to tell the Queen. We were excited; animated. The royal entourage arrived on the dot of their expected time and began to make their way through the itinerary we so painstakingly put together. I remember seeing the Queen up close and personal and thinking she looked radiant. She had soft, smooth skin and shining blue eyes. She took an interest in each person she met, asked beautifully well-briefed questions and graciously listened to each person’s story. Prince Philip broke away from the entourage and typically adopted a more spontaneous approach. We got wonderful images of him, head back and laughing loudly as he chatted to my colleagues. The Queen, gentle and genial, proved photogenic as always. I don’t think even the most strident of cynics would have criticised that visit to dusty Khayelitsha in 1995. I’m not an ardent royalist myself, but I was glad to be part of a visit that was truly special, relatively and appropriately ordinary and supremely intimate. And most importantly, it took place away from the glare of the media. For us, months of planning bottlenecked into a 10-minute visit that will stay with each one of us always. The weather was never going to disappoint. It was windy that day, and the sun shone as it always does. Not only was it a royal seal of approval for the micro-enterprise development work that our organisation did, but, more broadly, it was one way of welcoming South Africa back into the international community. No number of boats could have done that quite as perfectly. Yesterday’s Diamond Jubilee river pageant was an extravagant spectacle to commemorate Queen Elizabeth II’s sixty years on the British throne. 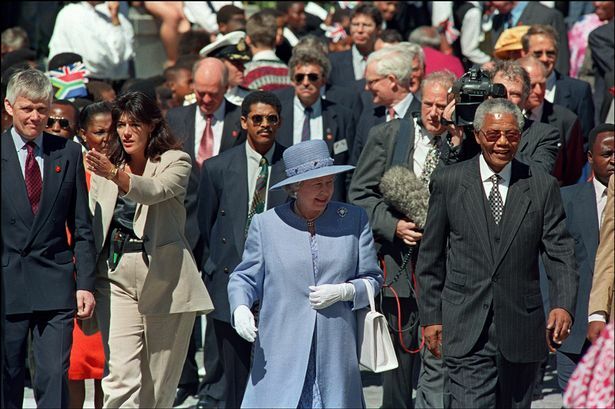 In March 1995, on Human Right’s Day in South Africa, the Queen commemorated something similarly historic, with slightly less pomp and ceremony, in a dusty township in South Africa. The occasion was no less grand. Khayelitsha is an informal township on the Cape Flats in Cape Town, South Africa. The Xhosa name means ‘new home’ and it is reputed to be the biggest and fastest growing township in the country. Our organisation worked in that community, among other similar communities, to train unemployed people to start their own small businesses. Being the project manager for the visit, I met three or four times with the royal team of Private Secretary to the Queen, press and police secretaries, as they made regular scoping trips to the country. We faxed letters to each other regularly. Information was paramount, planning was detailed, timing was precise. We learnt that when the Queen drives through residential streets lined with people, she drives at 4mph. She always gets out of her car on the right hand side. She needed verified information about each person she would meet and those people got information about meeting the Queen. For us, months of planning bottlenecked into a ten minute visit that will stay with each one of us always. The weather was never going to disappoint. It was windy that day, and the sun shone as it always does. Not only was it a royal seal of approval for the micro-enterprise development work that our organisation did, but, more broadly, it was one way of welcoming South Africa back into the international community. No number of boats could have done that quite as perfectly.